Below are various print materials you can use for promotion, equipping or outreach purposes. 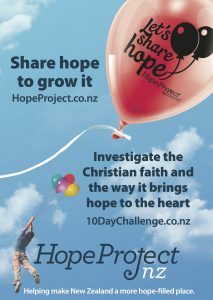 Included are the ‘Hope For All’ booklets, church booklets, A3 promotional posters and 10 Day Challenge cards. 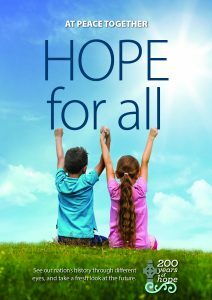 These booklets were produced as part of the Hope Project. They contain stories from our past; stories from peoples lives today; and stories and explanations of what Christians believe. They are a valuable resource particularity for outreach purposes. 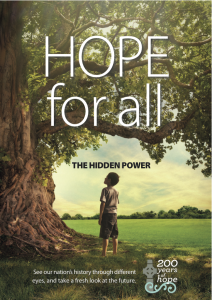 The theme of this first book addresses why Christians believe there is one God. Click image to open the PDF booklet. 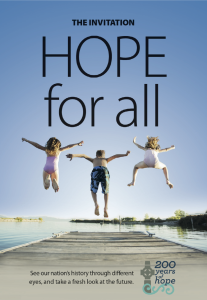 The central theme of this second booklet answers why Christians trust the Bible. 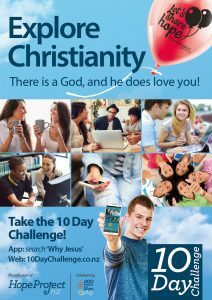 The series continues with this third booklet which has a central theme of explaining what Christians believe about Jesus. 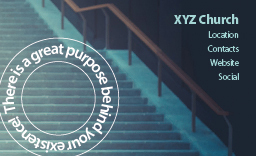 Click image to open the PDF booklet. Maori translation here and Chinese translation here. 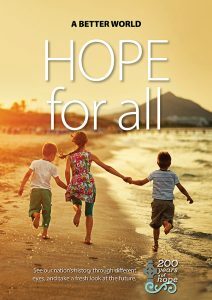 This fourth booklet which has a central theme of explaining what Christians values have influenced our culture today. 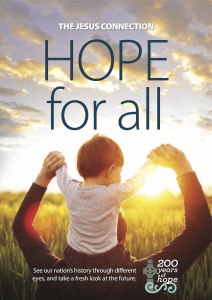 This fifth booklet explains the strong connection between our Christian heritage and our cultural views today on charity, and the equality of women and men. 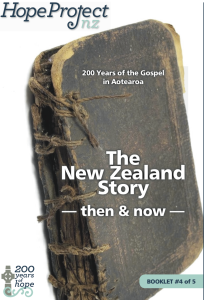 This five booklet series is called ‘The New Zealand Story – Then and Now’. They each have content of wide interest and are good value regarding our early Gospel history and equipping teachings for evangelism. They are great to give out as a weekly bulletin so that your members are informed and encouraged. Printing instructions for these free booklets are below. 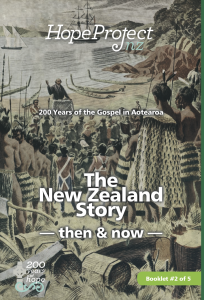 The series starts by looking at the story of the Gospel arriving in NZ and the benefits of a conversational approach to evangelism. Non-formatted version: print using the ‘booklet’ feature on a duplex photocopier (paginate, collate. fold). Print-ready version: print double sided, short-edge flip, actual size (not reduced), colour/B&W. 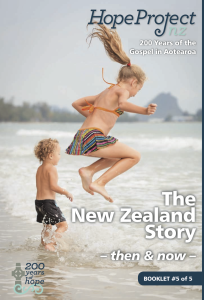 The second booklet looks at the Maori response to the Gospel and the power of story-telling. 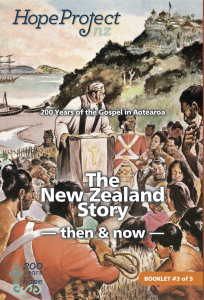 In booklet 3 we read about a remarkable early NZ mission vision and life-changing invitations. 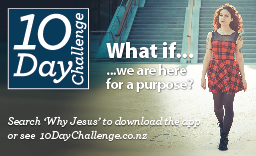 The series goes on to cover the story of the spread of the Gospel by Maori and also teaches about understanding courage and discouragement. 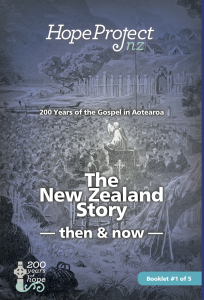 This booklet completes the series by sharing about NZ Christian heroes and the need for disciples, not converts. Print these posters for promotional purposes or contact us for a customized version with your churches details at the bottom of the poster. These are business card sized. 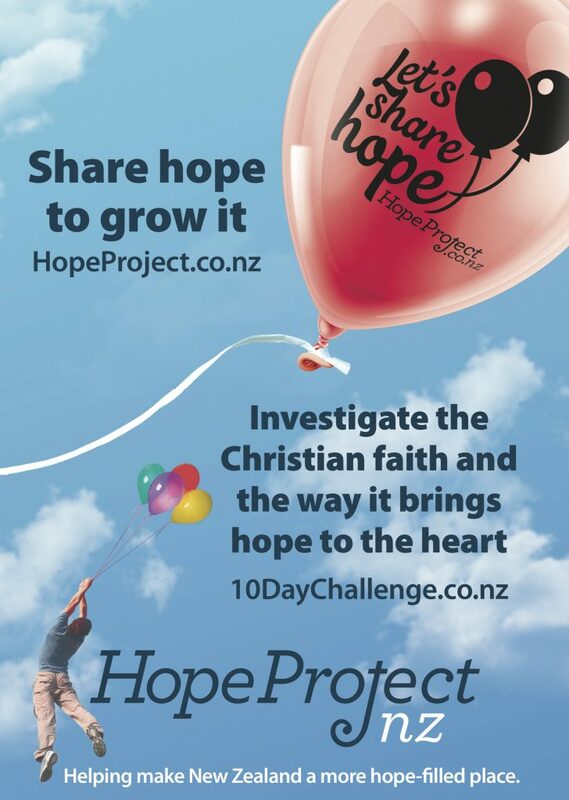 Print and give these to your members (along with a copy of a Hope Project book) for them to give to interested people that have spiritual conversations with. Click on the image to open the PDF version for double-sided printing direct to business cards. Contact us for a customized back with your churches details.